In my last post, I talked about my trip to the Space and Rocket Center. While I was preparing for the trip, I hit a snag. I wanted to bring both of my camera lenses, but I was determined to only carry my little backpack with me, which doesn’t have a pocket or safe place to stash my extra lens. 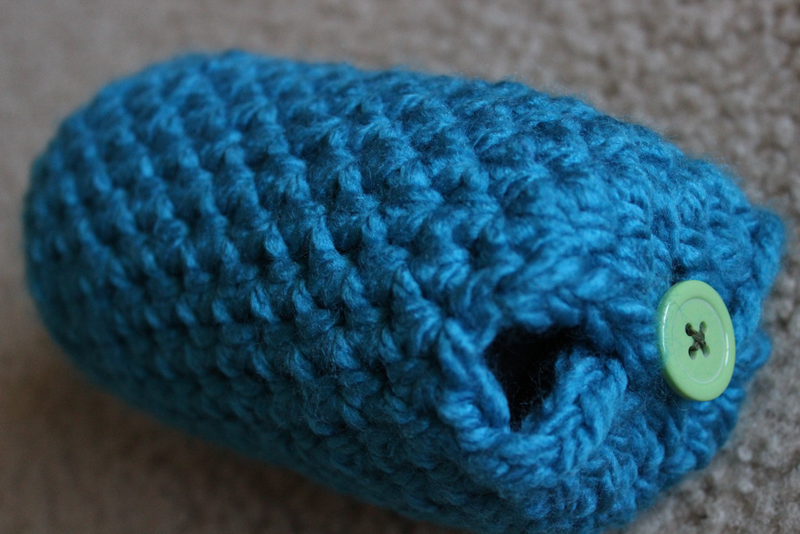 That’s when I decided to use some of my super bulky yarn to make a soft, cushy cozy for my lenses. It made me feel much more comfortable with storing them in my backpack knowing that nothing would knock the lens cap off or scratch them. And the thick cozy would keep them from being jostled too much. This pattern is very simple and I came up with it on the fly, but I thought that it would be something useful for others like me who are overprotective of their cam-baby. Also, I use a Canon T3i with the standard 18-55mm lens and a 75-300mm zoom lens so that’s what this pattern is written for. It can be easily adjusted for any lens width by adding extra increase rounds. It’s my first time writing a crochet pattern so I’m hoping that I was clear enough with the directions without being overly wordy. If you find any errors, please let me know! I didn’t take any measurements for my lenses. I had them with me while I crocheted so I was able to slip them in to check the length. You may find that your lenses are longer/shorter than mine. 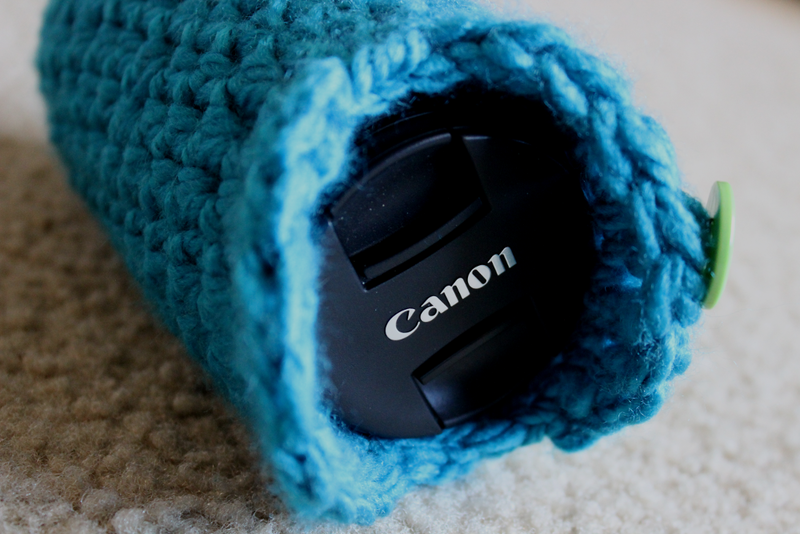 Just crochet until the cozy meets the edge of your lens cover and you’ll be good. 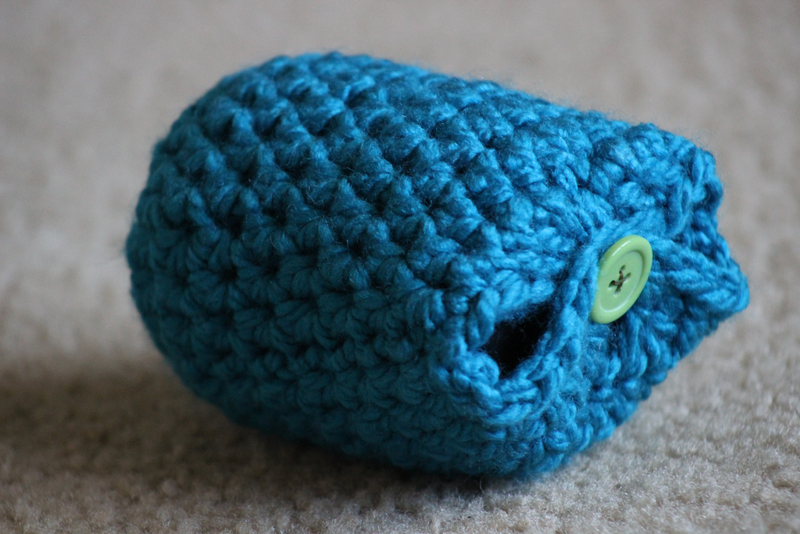 Start with magic loop or your preferred method of crocheting in the round. Break yarn and weave in ends. I decided to add a button to mine, but you may have your own creative ideas for sealing the enclosure. If you do decide to add a button as I did, I placed my button on one flap in the center of the 4 tc. As I sewed it on, I bunched the two tc on either side close to the button and inserted the needle straight through the yarn strands to hold it on. Once you attach the button, it should slide right into the middle 2 tc of the opposite flap!